← UNITY IN DIVERSITY; WHAT ABOUT DENOMINATIONS? Running as fast as his feet would carry him, Androclus raced into the forest. He hoped he could survive there, finding roots and berries to eat and avoiding all wild animals. He had few other choices; people were always looking for runaway slaves. He wondered, however, how it would be to live in terror of being discovered. Every pine cone that fell onto the mossy surface of the forest made him jump and look around to see if soldiers were in pursuit. He needed shelter. Rain was in the air and it would soon be dark. Through a break in the trees he saw an opening in the rocks. Thinking it might be large enough for him to sleep in that evening, he headed toward it. However, he stopped short and, looking to the right of the rock formation, he spied a lion. Instinct kicked in and Androclus ran, praying all the while that the animal had eaten recently. Hearing no sound of pursuit, he slowed down and the stopped. Looking back, he saw the lion had not pursued him. Its only movement was to roll its head looking at him with a rather mournful countenance. Slowly Androclus retraced his steps. The lion was in pain. He spoke softly to the lion, stroking his mane and back, and looking for some injury. Finally he found it — a nasty gash on the lion’s left hind leg. It was clear that the wound had been bleeding for some time and showed no sign of letting up. Androclus tore some of the cloth from his tunic and cleaned the wound. The animal shuddered and groaned before falling asleep. Just then the clouds opened up and Androculus crawled into the cave and immediately fell asleep. 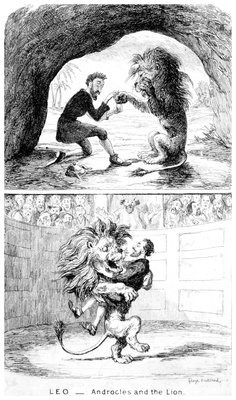 Minutes later, however, he awoke when the lion came in, dragging his wounded leg and laid down beside him. The cave was large enough for man and beast to live together, and they did just that for several weeks. Each day they would go out and hunt for sufficient food and water for the day. One day, when drawing water from a stream, Androclus felt something sharp against his neck. “Don’t move,” said a voice. “There is a big reward for the return of a runaway slave.” Forced back to the city, Androclus often thought of his friend the lion, sad that they would never again see each other. He was taken to see the Emperor who pronounced upon him the sentence of death. Soldiers took him to a stone cell beneath the palace where he was to await the day of his execution. Finally, he was led to the arena. The crowd cheered wildly as a lion, which had not been fed for four days, was let loose on Androclus. The animal roared and ran toward its easy prey. Androclus realized he had no chance and, thus, he closed his eyes and braced for the impact and pain. Instead of searing pain, however, he felt the warm tongue of the lion who playfully licked him until he fell to the ground. Androclus opened his eyes and before him he saw his friend the lion from the forest. Instead of bouncing to kill and devour him, as would be normal, even instinctive, especially after not eating for four days, the lion, once so gently cared for, fawned over Androclus like a friendly dog. The crowd in the arena was hushed to silence; the Emperor was stunned. He called Androclus to him. He told the Emperor the whole story. “Androclus and the lion are hereby freed,” said the Emperor. “Such amazing kindness, gratitude, and the ability to throw away the past must be rewarded.